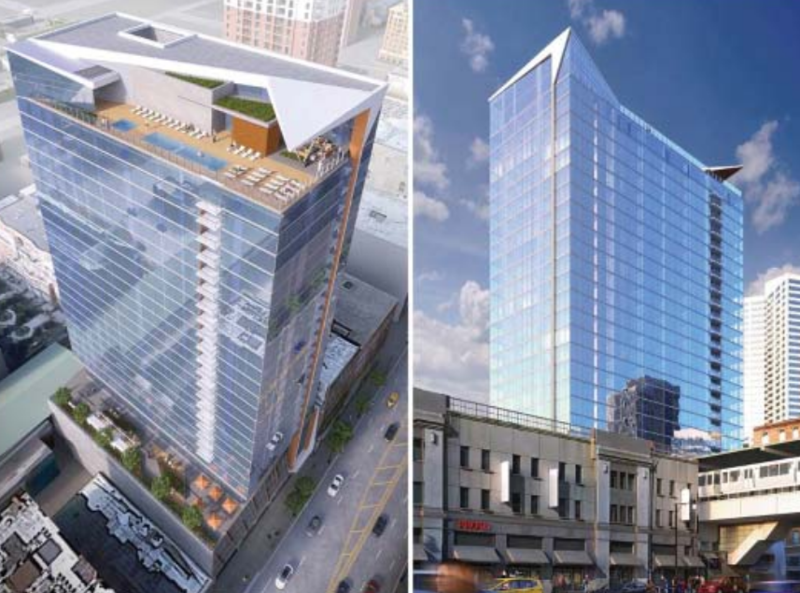 (Parking) Podium Finish: Does This High-Rise Deserve TOD Status? The massive parking podium will really flaunt the nearly twelve dozen garage spots. I have a few rules of thumb I normally use for judging whether a residential development has an appropriate number of off-street car parking spaces. If a land parcel is a significant distance from a train station and/or close to an expressway entrance, it’s understandable, if somewhat unfortunate, when the developer chooses to include a 1:1 ratio of parking spots to apartment or condo units. But a new high-rise planned for a surface parking lot at 1136 South Wabash, literally next door to the Roosevelt ‘L’ station, has me wondering if I should re-think my standards on what constitutes a transit-oriented development. The 26-story tower, which is a collaboration between developer Keith Giles and CA residential, will feature 320 apartments, mostly studios and one-bedrooms, and 5,000 square feet of first-floor retail. The project, slated for completion in 2018, includes 141 parking spaces housed in a five-story podium. On the plus side, it’s great that an underused parking lot next to a train station – a terrible waste of land – is being replaced by dense housing with several storefronts worth of commercial space. The location, a stone’s throw from two supermarkets, surrounded by shops, restaurants, cafes, and bars, will make it easy for residents to do many of their daily trips on foot. And, of course, the extreme proximity of the Red, Green, and Orange Lines, as well as several bus routes on Roosevelt and State, will facilitate car-free travel to much of the city. Unsurprisingly, the developers are playing up the building’s extremely convenient location. In a press release they note that it’s close to the South Loop’s “most popular shopping, dining and entertainment destinations, not to mention it’s just steps from Grant Park, the Museum Campus and Lake Michigan.” They also highlight it’s next to the CTA station and bill the project as a transit-oriented development. More views of the high-rise. It’s true that they are technically taking advantage of the city’s TOD ordinance. While the old zoning laws generally required a 1:1 ratio of parking spots to units for new residential properties, the ordinance essentially waives the parking requirement for buildings near train stations. With 141 spaces and 320 units, this development will have a bit less than a 1:2 ratio. But there are a couple aspects of this project that make me question whether it’s truly in the spirit of a TOD, i.e. a development intended to reduce car-dependency. First of all, there’s the five-story parking podium, a throwback to the dubious architectural trends of Chicago’s last residential building boom under Richard M. Daley. The unsightly podium really advertises the presence of dozens and dozens of garage spaces. Then there’s the question of whether such a high-rise right next door to an ‘L’ station and steps from retail, cultural attractions, and nightlife, and a roughly ten-minute walk from the Loop, really needs to provide a car space for almost every-other tenant. It’s true that the project is being billed as a luxury development, with high-end furnishing, loads of amenities, and rents starting around $1,500 for a small studio. As such, it’s reasonable to assume that the tenants will be relatively affluent and some of them will want parking spaces. On the other hand, half of the units are studios, with floor plans as small as 389 square feet. Clearly these studios and micro-apartments are geared toward young adults, and studies shows that millennials are increasingly uninterested in car ownership. As such, I expect that many of those 141 garage spaces will go unoccupied, but the South Loop community will still be stuck with that ugly parking podium. What’s your opinion – is this a reasonable number of parking spots for the location, or is this project unworthy of the transit-oriented development label? It’s a TOD, it’s just an ugly design. The architecture firm is on to something with some design elements, but the podium design is terrible for such a nice location. Close to three CTA train lines and Metra! I think that it is reasonable in an area like the south loop, that has a large percentage of renters who are recent arrivals from less walkable or transit rich locales, for there to be a parking space for every other unit. However, I think in the long term this parking garage will end up about as underutilized as the parking lot that it is replacing. I personally would have saved myself the construction costs, upped my unit count, and worked with ParqEx http://www.chicagobusiness.com/realestate/20161207/CRED0701/161209870/condo-owners-renting-out-parking-spaces-airbnb-style to link any tenants who need parking spaces to the many unused spaces in the area. For better or worse (worse) there’s a certain class of people who want to live an ‘urban lifestyle’ but can’t possibly imagine the thought of not having a personal auto in reach for the all important great American activity of the once a year road trip and ‘visiting parents in burbs’ and, wait for it, grocery shopping which is IMPOSSIBLE without a car. The developer knows it’s target buyer. No, the partking should be nixed. If the retail spaces need parking, an underground garage should suffice. As to therental units, the developer should include a monthly CTA pass gratis for all tenants, and perhaps 10 or fewer spaces for cityzipcarshare, as well as many bike lockers as there is not much space to stow a bike in 389 sqft. You’re looking at this from a transportation perspective, but think about it as an architect or developer. This site is sandwiched between two midrise buildings, with a noisy L station right behind. The “air space”, so to speak, occupied by the lower floors of this building has very little value EXCEPT as parking. It’s only on the upper floors (like, say, above the sixth floor) that you start to have access to natural light, views, and some distance from the noise of the L. The parking podium here is literally just that: a podium that elevates the building to a more desirable, higher spot. The parking inside is just a bonus. On a different site, like maybe a corner, not directly next to L tracks, the architectural possibilities would be different. And in fact, just a few blocks north, the exact same architect is doing a building at 30 East Balbo, on a corner, with no parking podium. Admittedly the site still has the L tracks problem, but they’re marketing the building to students so maybe they figure the students will put up with the noise for 9 months. You don’t mention that 80 of the units are two bedrooms. Presumably some of those units will have people with children who will want a car. There are also some people who still need a car for work. If 75% of the 2 bedrooms and 20% of the studio and 1 bedrooms require a parking space, that is 108 spaces needed for residents. That leaves 33 spaces for retail customers and employees. Those numbers don’t seem unreasonable and it is still an improvement over the 1:1 ratio. It’s odd to me that the logic is that people with the means to afford higher end units would always need to have a car. It seems more likely that those with disposable income would rely heavily on car sharing with transit as a backup, because they can afford to do so. Acoustically improved windows can all but eliminate ‘L’ train noise. Go to Inspiration Kitchen in E. Garfield right under the Green Line near the Conservatory where you can barely hear the train when it goes by. My thoughts exactly, though I’m sure there could be other uses for the some floors on the podium that most higher end buildings have such as a fitness center and separate storage units. You could even have front facing units on Wabash. Apples and oranges. Commercial space is fine next to the L tracks, but for residential you need privacy and natural light as well. No, blinds do not solve the problem. In theory you could replace the parking with affordable housing for a win-win, but I’m sure housing activists would be offended somehow. After the “poor door” controversy in NY, it seems like the urbanist community is fully committed to the fever dream that low income residents are entitled to the same kind of apartment that a $100k/year lawyer is. It’s definitely not TOD. Way too many parking spots considering it’s by THREE CTA train lines and the Metra. As another commenter has said, the developer could add a fitness area or storage to replace some of the parking. I’m only talking about outside noise reduction in interior spaces with acoustically improved windows. I work on the 9th floor i Streeterville on Michigan avenue and it seems like I can hear the honking and ambulances coming from street level as if I were on the first floor because of the lack of acoustic design consideration given to window selection. Again, please visit Inspiration Kitchen to experience for yourself the incredible difference the window system has on the noise. Directly beneath the train which is deafening outside, barely audible on the interior. Or maybe talk to someone at Shiner+Associates before making the decision in your own mind (and trying to convince others) about what programming is appropriate for ‘L’ train adjacent building space. This city has way too many parking spaces and other automobile accommodations, IMO. Well perhaps commercial space could go on those floors? Affordable housing would be a much better use of space and funds! I often ride by the massive parking structure by Truman College and would much rather look at recycled crate housing for low-income folks powered by solar power.